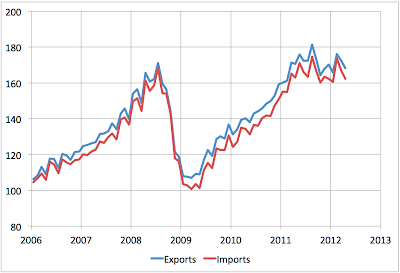 I updated my series for global trade (above - imports and exports should match but don't due to measurement error). The monthly data (through April) come from the WTO and I seasonally adjust them. After growing from early 2009 to mid 2011, global trade appears to have roughly stagnated for most of the last 12 months. In particular, it appears to have had a bump up in February of this year, but then to have fallen back in March and April. This coincides with the movement in oil prices - which peaked around March 8th. 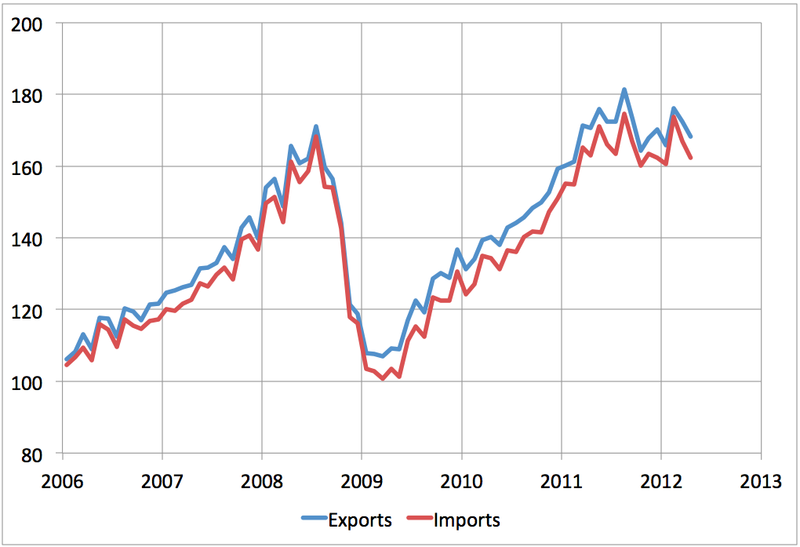 So, oil production has not been growing in 2012 and global trade has not been growing either. How much can the global economy have been growing? Well, probably a bit less than the official record suggests. Europe in contraction, U.S. Q1 growth was 1.9 % in real GDP(and then you have to take into account that the inflation measurement is the most lenient that they use, not even the core CPI). China and India as well.. I think China especially is completely fabricating their numbers. Their PMI from HSBC has been negative for 7 straight months and it reached a new low today. But yes, all this contributes to the pattern already observed.. growth cannot come without high oil prices which in turn suppress growth. We seem to be stagnating, moving sideways instead of up or down. Still, demand destruction has done quite a bit, Iraq is starting to ramp up more and more, Saudi has been far more resilient than the vast majority of doomsters and the U.S. domestic production shows great strides. As I see it, the biggest risks the next 5 years are not a sudden drop, but this slow and persisting stagnation which could in turn create massive social upheaval. We are already seeing a few signs of it in Canada, and we saw it in 2010 and 2011 with the Tea Party and the Occupy movement. People who think that Western socities are too 'old and comfortable' better think again. Finally, Stuart, I quite enjoy your focus on economics as well. Please do more of that, as there are far too many wannabebloggers out there who just yap and yap without showing charts and data like you.